Graduates of the Manassas Project SEARCH program appear with representatives of the project partners. On June 13, a graduation was celebrated in Manassas that was not an ordinary commencement. 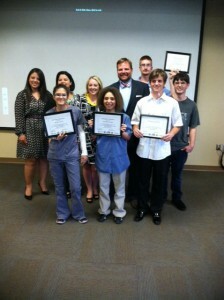 Seven students with disabilities graduated from the Project SEARCH program hosted by Novant Health Prince William Medical Center after completing a one-year internship program that prepared them for employment in the community. The 2014 graduates were Janyace Jones, Dorothy Jordan, Taylor Leib, Jeremy Natoli, Joshua Northan, Andrea Sorto and Oscar Vilchez-Perez. This Project SEARCH is one of several Project SEARCH locations in Virginia, all of which are conducted in partnership with a host employer, a local secondary school that works in concert with a community rehabilitation program, the Virginia Department for Aging and Rehabilitative Services and Virginia Commonwealth University. In Manassas, the local partners were Novant, Manassas City Schools and Manassas Park Schools, and Didlake, Inc.
Project SEARCH is dedicated to enabling young people with disabilities to successfully transition from school to adult life. The goal for each student is to gain competitive employment. The students attended the program for a school year at Novant, which provided an on-site classroom and a series of three targeted internships that were staffed by the hospital, a special education teacher from the school system and an employment specialist from Didlake, Inc. Students spent five hours each day at the internships, where they acquired competitive, marketable, and transferable skills to enable them to apply for a position related to their internship. All seven Project SEARCH students were offered employment prior to their graduation. Congratulations to the students on their graduation and to the staff of Prince William Hospital, the program’s instructor, Ryan Gast, and Didlake Employment Specialist, Stacy Hart, for making this year’s Project SEARCH an unprecedented success.